SysnovaFeed is a revolutionary free/open-source least-cost feed formulation software by Sysnova Information Systems Limited. SysnovaFeed software is a comprehensive free/open-source tool designed to meet the formulation needs of professional nutritionists and feed producers. The free/open-source nature of SysnovaFeed also makes it ideal for use in academic institutions and universities. SysnovaFeed is user-friendly and simple to download and set up on any desktop or laptop computer. SysnovaFeed is customizable and easily allows any nutritionist to enter unlimited numbers of ingredients and formulations. SysnovaFeed aims to bring benefits of the free/open-source software movement to the global livestock industry. Ingredients: SysnovaFeed contains a default nutritional database for major ingredients like maize/corn, wheat, wheat bran, rice, rice bran, soybean meal and soybean oil based on nutritional specifications. Users can edit these nutritional specifications and add unlimited ingredients. Formulations: SysnovaFeed contains default formulations for well-known breeds of commercial layers based on published nutritional standards of breeding companies. Users can edit these formulations and add unlimited new formulations. Prices: SysnovaFeed comes with a default set of prices which the user can update to reflect current market rates. SysnovaFeed desktop formulation software is released under an open-source license which means it will never require any license fee. SysnovaFeed formulation software has been developed in Java programming language, which supports all computer operating systems (MS Windows, Mac and Linux). An Android app will also be released in future. All formulation, ingredient and price data is stored in free/open-source H2 database, which is also written in Java and will work in any platform. Least-cost optimization is done by free/open-source Gnu Linear Programming Kit (https://www.gnu.org/software/glpk/). 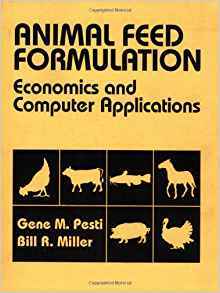 We are grateful to Professors Gene Pesti and Bill Miller for writing their book on feed formulation software. Commercial Web-Based Version: A web-based multi-user collaborative version of SysnovaFeed will be released as a commercial product for purchase by large companies with multiple feed mills and nutritionists. Download SysnovaFeed_Win64bit-master.rar which should be 90.4 MB. 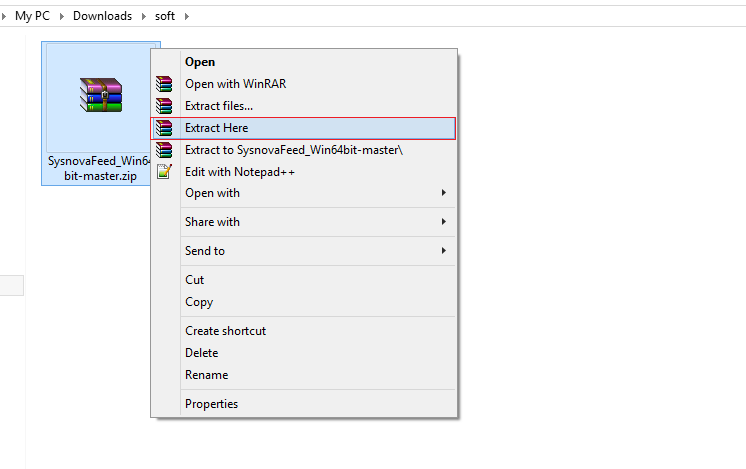 Extract the files by right clicking on SysnovaFeed_Win64bit-master.rar file. Right click on setup.bat file and click "Run as administrator". 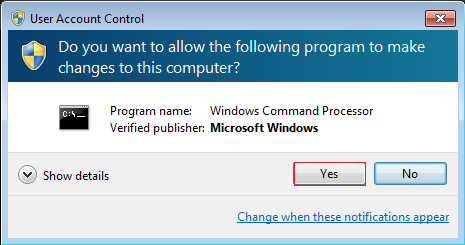 Allow by clicking yes button .A comand prompt will open and install the software . A shortcut will be created in your Desktop name as "SysnovaFeed". 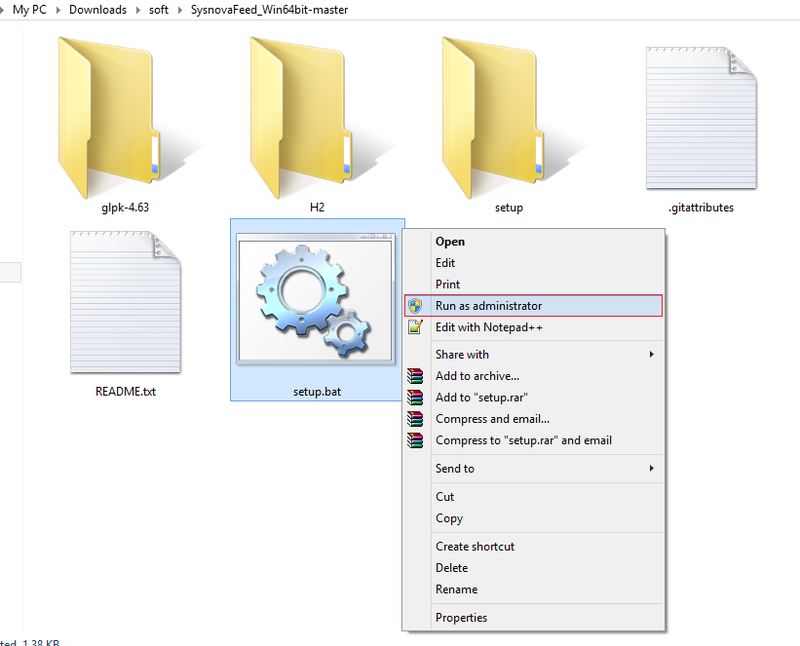 After Completing installation double click the file "SysnovaFeed" in your Desktop and start using .